At Red Argyle, we are heavy users of JIRA for project management. We use JIRA for tracking everything from client work to internal projects to blog posts. JIRA allows us to clearly define steps for each project and to group tasks into manageable sprints when necessary. Red Argyle’s project management process has improved vastly since adopting JIRA, and that process is continuing to improve as we hone our JIRA skills and further develop our strategy around using the platform. After working with JIRA for a while, I found that I faced a challenge. Since we track just about everything in the program–internal and external, priority and non-priority work–it can sometimes feels overwhelming. Sometimes I just need a simple list of what I should be working on. Instead, I can easily get distracted or overwhelmed when browsing through my list of tasks, many of which are dated far in the future or put on hold or backlogged for the moment. I recently realized that I needed a quick way to see what I should be working on. One way to do this is to create a customized JIRA dashboard. At Red Argyle, we have our own versions of those, but, in this case, I was looking for something different–I wanted a morning email digest that lists the tasks I should be focusing on. It took some research, but I found a solution. First, I set up a custom issue filter that produces a customized list. That list includes specific tasks that meet these criteria: 1) they are assigned to me, 2) they are marked with a specific status, and 3) they are due within one week or are overdue. After establishing the filter, I set an email subscription on it. Now, every morning I receive an email with a list of the tasks that fit the filter’s requirements. Go to Issues and create a New Filter. Set up all of the filter details, name the filter, and save it. To create a subscription on this filter, click the Details link next to the filter name and then click New Subscription. On the Filter Subscription page you can set up all the details for this subscription. I set mine to run once per day: Monday through Friday at 8am. That way, I have my digest delivered first thing in the morning. Click Subscribe to save the subscription. To test the subscription, click the Details link next to the filter again. You should now see a new link for Manage Subscriptions. On the Manage Subscriptions page, you can edit and delete the subscription, as well as force it to run at the present time. Running it now will allow you to get a preview email instead of having to wait until the next scheduled run. 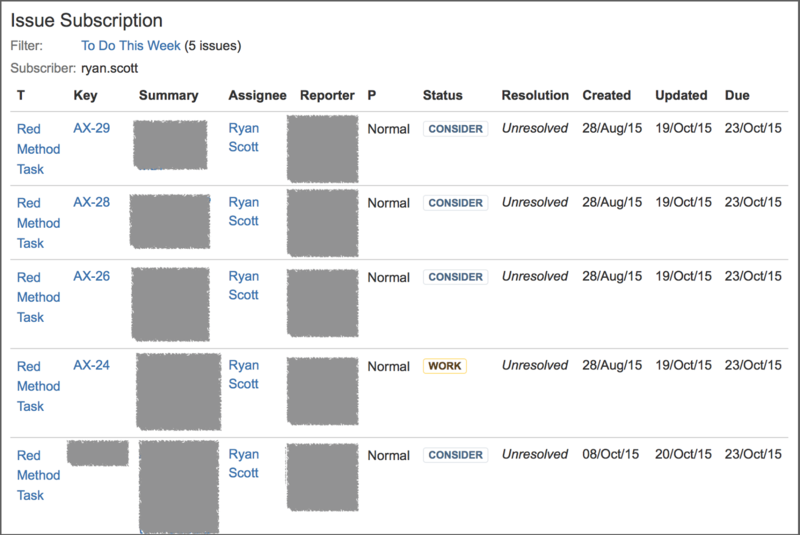 How do you manage your project tasks in JIRA (or in different project management software)? Do you have a different solution that helps you keep track of a giant To Do list? Let us know in the comments below. You could apply this to salesforce.com cases as well, generating delivery of a morning report on open cases. And for that matter, what do you use to connect salesforce.com to Jira? Create a Jira ticket from salesforce.com? Link Jira ticket to cases? Push or pull updates? Great idea about the morning report of Salesforce cases. We don’t currently connect Salesforce to JIRA. We had briefly looked into it previously and Service Rocket seemed like a solid option. Zapier is also worth checking out, we use them a lot for other integrations and they definitely support both Salesforce and JIRA connections.